After being slaughtered, chickens should be cooled down quickly to inhibit bacterial growth and ensure food safety. Two methods are used. Water chilling and Air chilling. The easiest way is to submerge them in an enormous tub of ice cold chlorinated water. This is called water chilling. This method is quick and efficient but has a few setbacks. It uses gallons and gallons of fresh water. While submerged, the chicken absorbs 2-12% of the water by weight so you will be paying about 2-10% extra for the absorbed water. This method increases risk of cross contamination and that’s why the water is chlorinated. The skin of water chilled chicken, does not crips well after roasting. Chicken can also be cooled down, using blasts of ice cold air. This is called air chilling. Each chicken is hung and passed through a series of refrigerated chambers until they reach the required safe temperature. 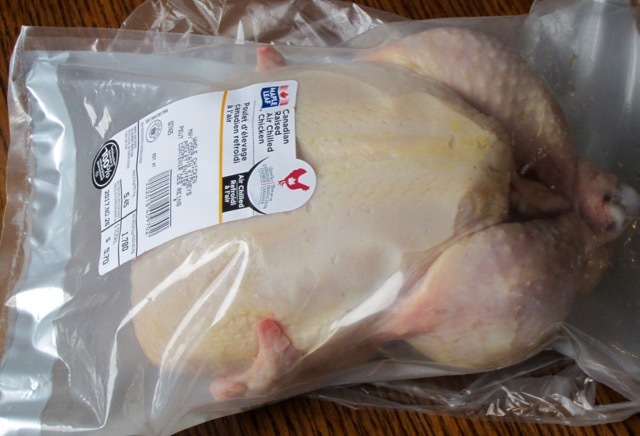 What are the pros and cons of air chilled chicken? This method is more expensive so air-chilled chicken costs more in-store. It’s the preferred method in Europe. The cooling is slower compared to dunking them in ice cold water. There is less risk for cross contamination. Gallons of water are conserved. The chicken loses some water during chilling. Which bacteria are associated with Chicken? There are two types of bacteria commonly associated with raw poultry: Salmonella and Campylobacter. Prev What is the difference between steel cut, rolled and instant oats? Thanks Liz for explaining the difference. No problem! I hope you’re enjoying Sunday? Thanks Liz. It’s Monday morning for me and I’ve just arrived at work. Oh fancy..it’s Sunday going 4pm, here. I’m thinking of dinner right now.